Much of the buzz surrounding this year’s NAB Show revolves around one specific technology, 3D. Films featuring 3D elements are nothing new, they’ve actually been around in some form for over 100 years, but now movie studios and television networks are betting big on 3D in the home. ESPN 3D will lead the 3D wave coming this summer and will launch in June, with many of the details being announced at NAB. 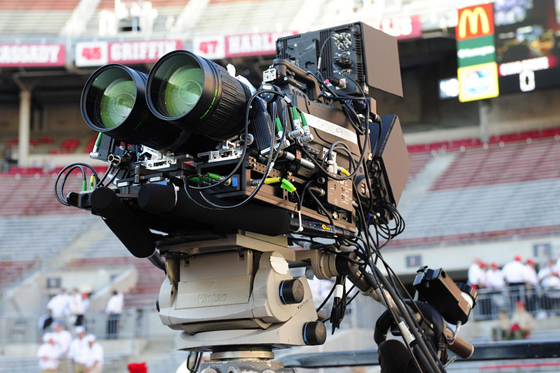 An ESPN 3D camera setup. Along with content, many suppliers are also creating platforms to bring this content into households using new streaming technologies and pricey television sets. Vizrt has also been on the forefront of the 3D movement with many new applications to create 3D graphics. With content and systems now in place, one question still remains, will local viewers buy into it? Like other recent technologies, 3D requires more investment and money… something people aren’t spending like they use to.